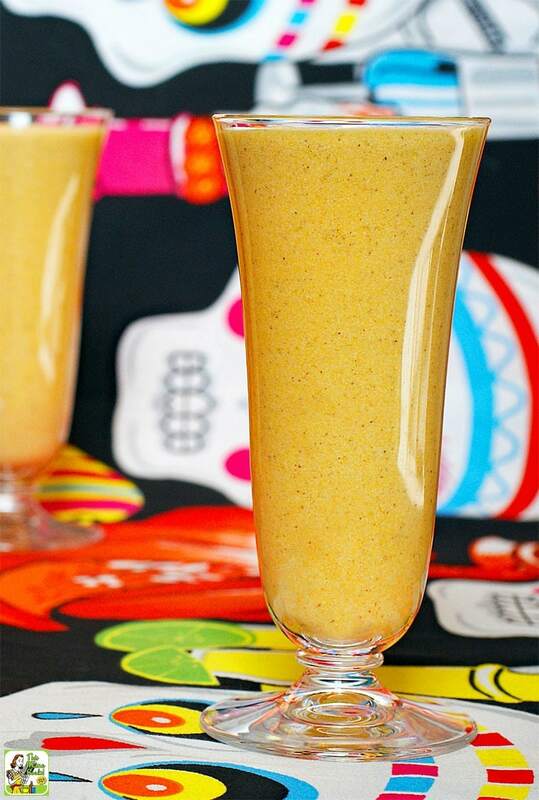 I created this Healthy Pumpkin Pie Smoothie as sugar free drink to celebrate Dia de los Muertos – Day of Dead. It’s a Mexican holiday which focuses praying for and remembering friends and family who have passed away. Many of the traditional foods for Day of the Dead are sweet like sugar skulls, chocolate skulls and coffins, Pan de Muerto, and Candied Pumpkin (Calabaza En Tacha). Thus inspired I thought I’d come up with a healthy drink to toast the day and remember friends and family who have passed. However, if you’re looking for healthy breakfast smoothie recipes that are dairy free or vegan, this pumpkin smoothie is the drink for you – any time of year! 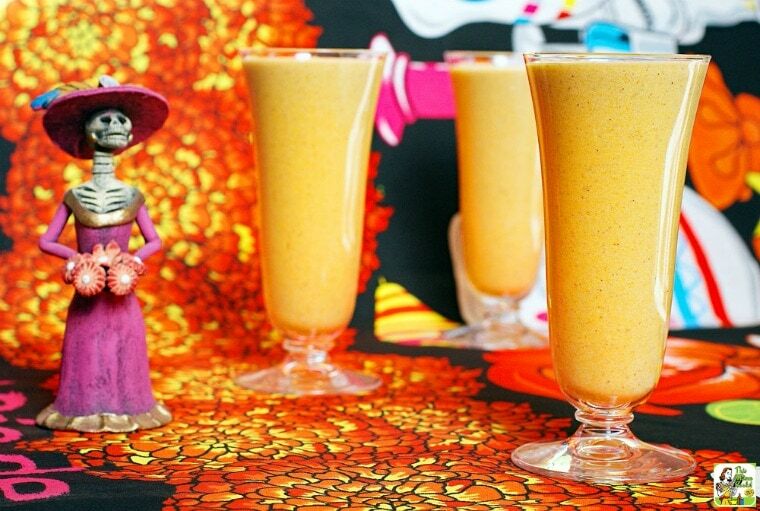 This Healthy Pumpkin Pie Smoothie is sugar free and vegan! To make this easy pumpkin pie smoothie sugar free, I used monk fruit sweetener, which I love because it’s a natural, no calorie sweetener that can be used just like regular sugar and has no unpleasant aftertaste. Since I have a food sensitivity to the whey in milk, I used soft tofu instead of yogurt, making this recipe great for vegans and anyone who is dairy free. I also love using tofu in smoothies because it’s packed with protein, which keeps you fuller longer. 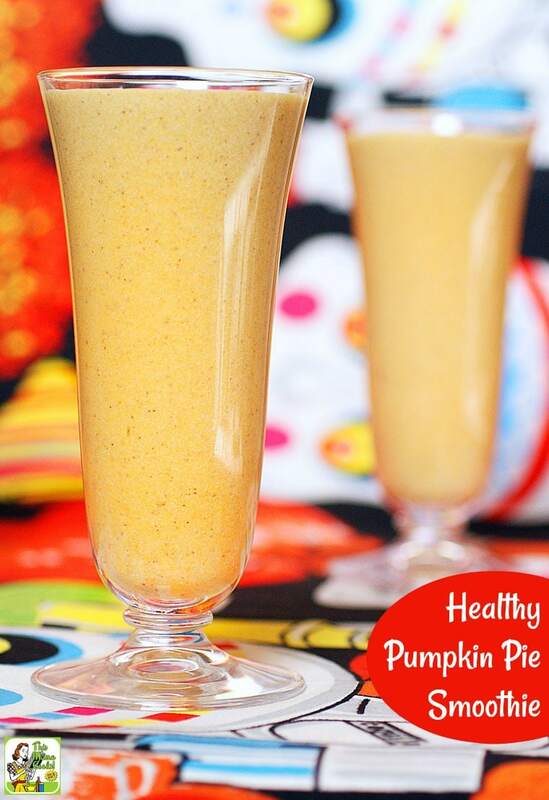 This Healthy Pumpkin Pie Smoothie is perfect for an on the go breakfast or snack. You can also use this pumpkin spice smoothie recipe to make a Dairy Free Pumpkin Pudding. Just omit the ice cubes and cut back the coconut milk to 1 cup. Then chill the pudding in small bowls until firm. Finally, remember to stock up on canned pumpkin during the fall sales. Pumpkin should be enjoyed year round, and not just during the fall. That’s because it’s full of fiber, vitamin A, low in calories and can be used in baking, stews, chili, soups, ice cream, popsicles and of course, smoothies! 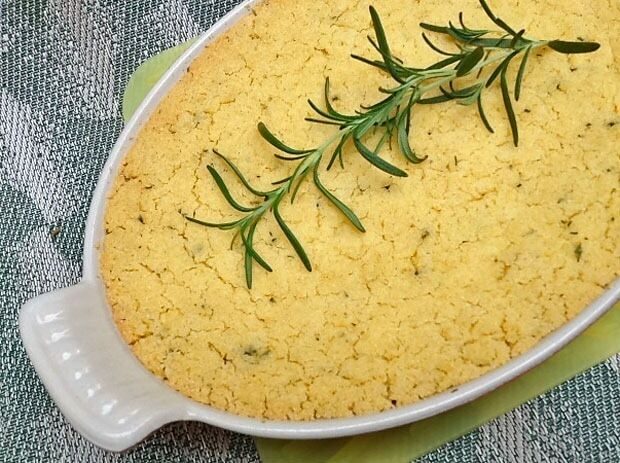 Check out more of my pumpkin recipes! Originally published on November 1, 2011. Updated with new pictures and information. What a great recipe! I’ve never thought to use tofu in a beverage. Thanks so much for linking it up to my blog hop last week! Amber, it should be fine for a few days in the refrigerator, but you may need to stir it up before serving if it’s sat for a while.